Susan Collins must be freaking out. The Republican senator from Maine, who positions herself as a pro-abortion rights moderate, signaled early support of Brett Kavanaugh, President Donald Trump's Supreme Court nominee. According to a HuffPost source, Collins allegedly green lit Trump's nominee before the president even chose Kavanaugh, though she strenuously denies this. The senator now faces activists who have so far raised $1.3 million and counting via crowdfunding for any opponent to run against her in 2020. A rattled Collins has resorted to calling this "bribery" in an "exclusive statement" to right-wing website Newsmax, which tells us exactly which audience she's attempting to shore up and gain sympathy from. This claim is just plain silly since no one is planning on actually paying her the money. She should look up Citizens United v. Federal Election Commission for a definition of bribery, a ruling handed down by several justices for whom she voted, and a ruling which she's benefited from in the form of corporate donations. Perhaps Collins, who seems to have lived in that cocoon in which senators who've been in office for decades often find themselves, is suddenly realizing that we're in a different time and that she's sealed her fate. 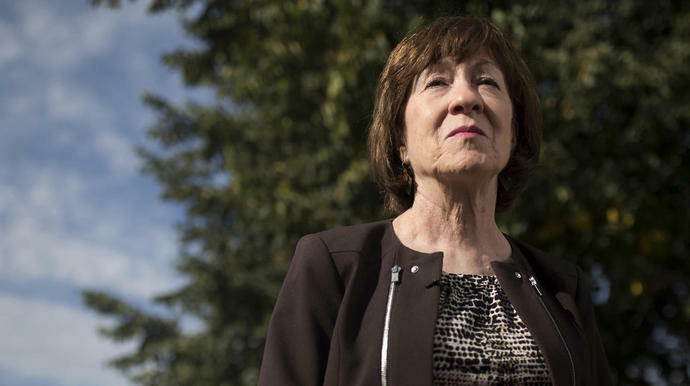 Who knows what Trump may have promised Collins or what she's afraid he might do to her if she were now to go back on any assurances she may have given on Kavanaugh. Perhaps Collins is worried about a primary challenge from the right in 2020. I would be. Senator Ted Cruz (R-Texas), meanwhile, is begging for help from the same GOP leaders he's attacked in the past (like Senate Majority Leader Mitch McConnell (R-Ky.), whom Cruz called a "liar" a few years back) as he tries to fend off a serious challenge from Democratic Congressman Beto O'Rourke, who is galvanizing support across Texas and coming up even with Cruz in polls. It appears grassroots fundraising has slowed for Cruz and exploded for O'Rourke. Ironically, Cruz is also turning to the same man who helped turn the GOP radioactive: Trump, who announced he's heading to Texas to stump for Cruz next month. The same Cruz whom Trump called "Lyin' Ted." The same Trump whom Cruz called a "sniveling coward" and "serial philanderer." And now McConnell is openly fretting about losing Republican control of the Senate. While the House has been in play for Democrats for months, their chances only grow by the day to take control of the chamber, as new polls show further momentum. But control of the Senate, seen as a long shot just weeks ago, is also now a realistic, less-daunting possibility. McConnell even told reporters this week, "I hope when the smoke clears, we'll still have a majority." GOP leaders mused in the recent past about taking seats from Democrats in Wisconsin, Pennsylvania, Ohio and Michigan ― all states Trump won. But those efforts have largely evaporated. Now McConnell and GOP leaders are diverting precious time and money to states where McConnell sees a "knife fight in an alley" to retain or take seats: Arizona, Nevada, Tennessee, Montana, North Dakota, Missouri, Indiana, West Virginia and Florida. Fighting to keep Senate seats in Texas and Tennessee was never in the GOP's game plan (nor in anyone else's wildest imagination). Now, Trump is all they've got. Their tax law, benefiting the wealthy and corporations, went nowhere in galvanizing voters for the midterms (many having likely seen it for the scam that it is). According to a recent Fox News poll, it's now more unpopular (40 percent) than Obamacare (51 percent). Vicious anti-immigrant rhetoric, always a desperate last resort, only hurt the GOP in Virginia's 2017 gubernatorial and legislative races and in special elections across the country. But that hasn't stopped Republicans from deploying racist attacks this election season in full force. As Frank Sharry of the immigration group America's Voice notes, we can expect "an ugly midterm election strategy: smear immigrants as criminals and attack Democrats for defending them." For McConnell and GOP Senate candidates, at least, the plan, from a while back, has been to grab onto Trump and back all of his ugly, racist rhetoric, hoping he'll keep them afloat. But Trump's approval is quite suddenly sinking into the mid-30s in a slew of new polls ― tanking among independents and in the Midwest ― while, in that same recent Fox News poll, special counsel Robert Mueller, leading the Russia investigation, has a soaring 59 percent approval rating. There are now few states the GOP can send Trump ― who, on his own, is deciding where he wants to go anyway ― because even if he may help in a statewide race, he will hurt GOP House candidates in suburban districts in that same state who are running as far away from him as they can. As has been said many times, anything Trump touches, he destroys. None of this, of course, is certain, underscoring why progressives must double down their energy. With voter suppression, possible Russian electorial interference and the usual GOP arsenal of dirty tricks, Republicans may be able to cling to power in both chambers. Gerrymandering has helped to rig the system, too. And even if Republicans are hurt by embracing Trump, much of it is cold comfort for progressives and all who care about the future of America. Collins may pay a price in 2020 for voting to confirm Kavanaugh, but we'll still be stuck with Kavanaugh and a radical shift of the Supreme Court for decades. The country will experience profound change, from the gutting of Roe v. Wade and threatening LGBTQ rights to an expansion of presidential power and further assaults on the environment. A lot of the damage that Trump has caused unilaterally or with the help of the GOP Congress will be difficult or even impossible to undo, even if Democrats were to take both the Senate and the House, keep control of each chamber for several years, and even win the presidency in 2020. But we must start somewhere at turning things around as we face the most devastating and harrowing political reality of our lifetimes. That's only going to happen when the GOP hits rock bottom as progressive momentum surges. And it's appearing that may happen this November.